Something amazing happened on September 13 & 14. I’ve been a Christian for 20 years, but nothing like this has ever happened before. I’m trying to piece it all together so that I can write about it here, but there is so much that I really need to do it in pieces. My friend and I live-streamed Beth Moore’s “Living Proof Live” simulcast on Saturday, September 13th at my house. During the simulcast, there were a few times where the live stream “stuck” and I had to refresh the screen. 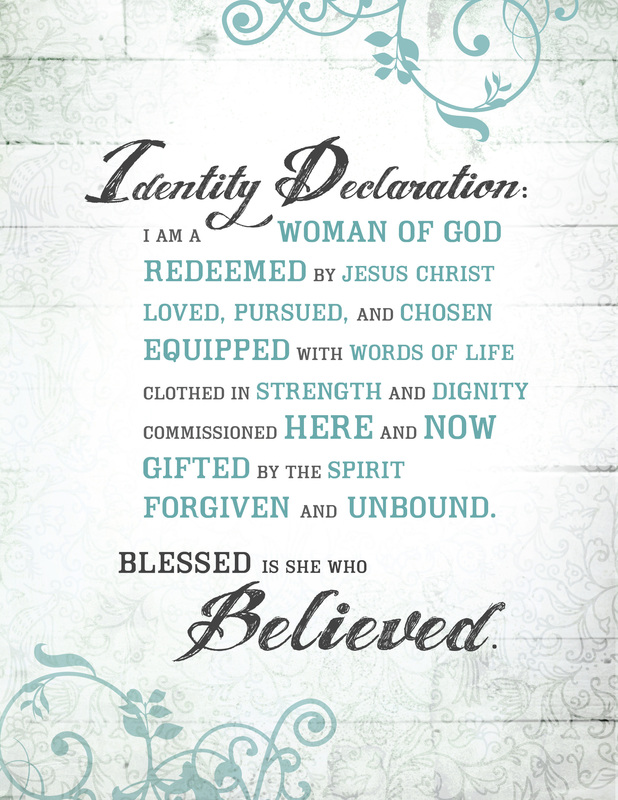 Beth was teaching us her “Identity Declaration” (click or see below) and she got to “I am a woman of God, redeemed by Jesus Christ” and the screen stuck. By the time I got it refreshed, she was on to the next point. “Redeemed” struck me and I knew I wanted to go back and watch that part again. However, we were all headed to the Third Day/ MercyMe concert at DTE Energy later that afternoon, so “redeemed” would have to wait. Even though I bought the concert tickets for all of us to see Third Day, we were blown away by MercyMe. Bart Millard, their lead singer, has been on an amazing road to transformation over the last couple years and it was exciting to hear his story. He spoke and sang a LOT about redemption and the word “redeemed” kept sinking further and further into my bones. Their music was upbeat and invigorating, their harmonies were beautiful, we loved every minute. It was late when we got home and I was ushering at church the next morning, so we had to get to bed to get up early. “God spoke! Beth’s prayers were answered in my life. He gave me a word and that word is “redeemed”. I have struggled with so many things for so long: depression, hopelessness, wanting to give up, and I’ve “tried” to do better and be better and I want Jesus to help me, but all of my “tricks” aren’t working anymore. I think wrong thoughts and then I feel guilty for thinking wrong thoughts and it just spirals downward. This weekend God told me “Jesus redeemed that”. Every thought – Jesus redeemed that. The guilt about the thought – Jesus redeemed that. Not wanting to get up and do anything – Jesus redeemed that. Getting up and doing something, puffing up my ego and pride – Jesus redeemed that. Doing things to get attention – Jesus redeemed that. Getting mad at my kids – Jesus redeemed that. Feeling overwhelmed and anxious – Jesus redeemed that. Scared to open an email, wondering if I can handle what I’m being asked to do – Jesus redeemed that. Everything I’ve ever done or said or thought or will ever do or say or think – Jesus redeemed that.